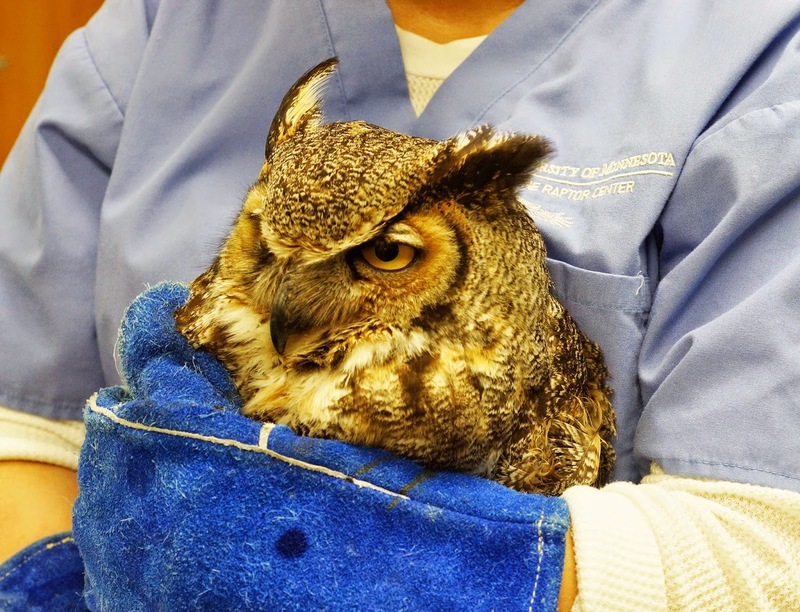 The Raptor Center: Great Horned Owl Patient Teaches Us Something We Can All Do to Help Raptors . . .
Great Horned Owl Patient Teaches Us Something We Can All Do to Help Raptors . . .
to get her back to her nest site as quickly as possible. May is finally here and brings with it thoughts of spring planting, honoring our mothers on Mother’s Day, and for many, enjoying a family outing for the Minnesota fishing opener. In the raptor world, May is also a family month - many species are incubating eggs, or for some like great horned owls, hunting for their hungry brood. As our outdoor family activities increase so does the potential for our actions to influence the lives of species often unseen. she sustained from being caught on fishing line. 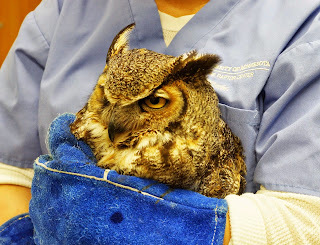 One example is great horned owl patient 15-189 who was admitted to The Raptor Center's clinic on Sunday. She was found hanging from a tree by fishing line that was tangled on tree branches. 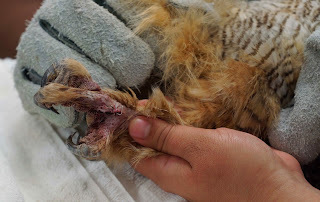 When the bird was admitted to our clinic, it immediately became apparent that she was a mother; she has a brood patch, which is a bare area of skin on her abdomen that was used to provide heat to her developing eggs. She no doubt still had chicks that are depending on her. She suffered soft tissue injuries to her left wing and her feet. Although the male will do his best to provide food to the dependent chicks, young raptors eat A LOT of food and he will need her help. It is critical that she be returned as soon as possible to her nesting area. Please think about wildlife when fishing or engaging in any outdoor activity this spring and summer. In most cases, it takes just a few moments to ensure that you don't leave anything behind that could potentially cause harm to the creatures we share this world with.